It’s 10:05 a.m. in Courtroom 2B in the Leon County Courthouse. Deputies lead five men wearing green jail garb into the room and toward a bench off to one side. They are hunched, because wearing shackles attached by chains to handcuffs requiring them to advance only by tiny steps. They take seats and wait for the proceedings to begin. Second Judicial Circuit Judge Martin Fitzpatrick takes the bench. One by one, the accused stand before him, flanked by one of the two assistant public defenders in court today — John Knowles and Elizabeth Vallejo. Most are here to enter plea bargains or settle on court dates. Another day in the life of a public defender. “You really have to love humanity,” said 2nd Circuit Public Defender Andy Thomas, who took office in January 2017. He supervises 65 staff attorneys, including 23 who work exclusively on appeals, plus social workers, investigators and support staff. 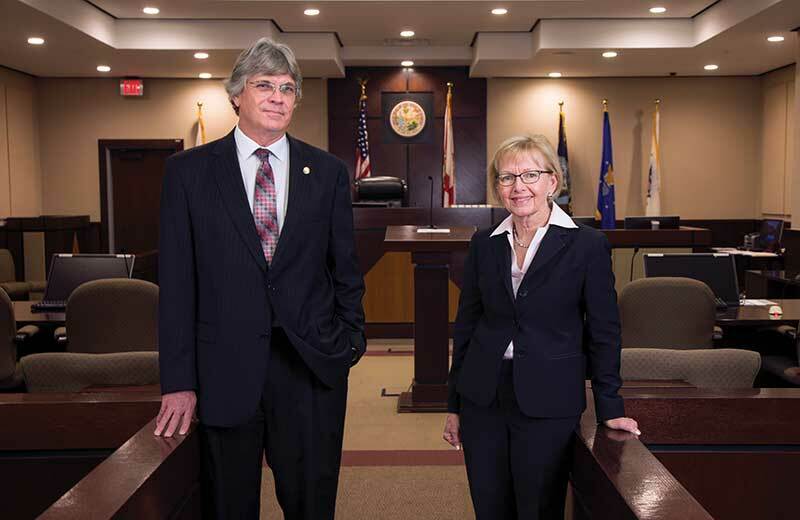 The circuit’s 42 trial attorneys cover six counties: Leon, Jefferson, Gadsden, Liberty, Wakulla and Franklin, while the appeals attorneys cover 32 counties from Escambia to Duval to Alachua. The office shares the Leon County Courthouse’s fourth floor with the 2nd Circuit State Attorney’s Office. The Public Defender’s office represents 80-85 percent of the accused in circuit court in Leon County — the ones who can’t afford a private attorney who might charge $5,000 to handle, say, a DUI. Thomas said in a recent interview. This is the “holistic approach,” pioneered locally by Thomas’ predecessor as public defender, Nancy Daniels. Thomas joined Daniels’ office in 2000 and was her chief assistant for nearly 15 years. In 1992, Daniels and then-Chief Judge Philip Padovano instigated the creation of a drug court — only the third to operate in Florida. These courts closely supervise drug defendants, making sure they take drug tests, attend counseling sessions and visit court frequently. Participants who stay clean can win dismissal or reduction of charges. Failure brings immediate repercussions — a night behind bars, for example. But judges also act as cheerleaders, encouraging participants to succeed. “It’s more of an emphasis on trying to help the individual and provide therapy and rehabilitation. They expect a relapse. If you’re a drug addict, they know you’re going to use,” said Joel Remland, a retired assistant public defender. The logic wasn’t clear to everyone at the time, but even Willie Meggs, then the 2nd Circuit state attorney and no coddler of criminals, became a fan. The program was extended to cover juveniles, veterans and people with mental illness — although the mental health court has languished for lack of money. “It’s not just a slap on the wrist,” Daniels said in an interview in the offices of the Florida Association of Public Defenders, where since her retirement she analyzes legislation and writes talking points. Community mental health resources can’t keep up with the demand. Thomas has added a social worker — bringing the total to three — to identify people who commit minor crimes because of untreated mental illness. One-third of the people held in jail are on psychotropic drugs. “They don’t necessarily need to be in jail. They need to be somewhere where they have food to eat and somebody making sure they take their meds,” Daniels said. It might be easy to mistake these initiatives as soft on crime, but Daniels won’t have it. “When people get the services they need, they don’t commit crimes so much,” she said. If you just put them in jail for a little while and let them out without any services provided, they’re going to keep doing the same things. If you make an effort to give them treatment for the thing that brought them there, you’re interrupting the cycle of crime. You’re helping society and you’re helping the criminal justice system. State Attorney Jack Campbell, the 2nd Circuit’s chief prosecuting officer, is convinced the holistic approach reduces recidivism. “I think it’s great. We look at them as complete human beings, and not just as a summary of the charges or the incident,” he said. “If you’re putting the interests of your clients first, you need to recognize that we need to make them not get in trouble again — to make sure this is the only time they come to our office,” Campbell said. Initially, even some defense attorneys were skeptical about drug court, and the approach sometimes runs contrary to a defender’s instincts. What if a client desperately needs drug treatment, but the case deserves to be thrown out because of procedural error? What truly represents the client’s best interests? “There’s a lot of common ground between social services provision and legal representation. If there’s a way to help that person get out of the cycle of crime, great. But if it just comes down to legal representation, that always supersedes other things,” Daniels said. “The Florida Bar tells us that if you’re defending someone in a criminal case, they have the right to zealous representation — that we are to argue every arguable point within the bounds of law,” he said. The fact is that fewer than 5 percent of the cases lodged locally go to trial. The rest settle through plea bargains. Daniels estimated that as many as 15 percent end in dismissal of charges. “You can’t set every case for trial. The dockets simply can’t accommodate it,” she said. The attorney-client relationship hinges on trust. Thomas and others say the answer includes recruiting more minority attorneys and community outreach. For outreach, Thomas acquired $35,000 from the Florida Legislature for a van that will take volunteers into neighborhoods — to “take services where the people are,” he said. Daniels believes the approach pays off in community support — from the Leon County Commission; from Big Bend Community Based Care, the big social services provider; from the NAACP; from the ACLU. Activists learned the office would work with them when possible, she said. On the other hand, there’s the suspicion in some quarters that defense lawyers scheme to let the guilty go free. “Some prosecutors and some outside forces think that defense lawyers are just evil and that we would do anything in the world to get our clients off,” Daniels said. “It’s so untrue, because we operate under a code of ethics. While defenders and prosecutors often cooperate, elbows sometimes fly in the heat of a court fight. Yet the two offices stage friendly competitions on the softball field, he said. And weddings between prosecutors and defenders are not unheard of. “Some of the best lawyers I’ve ever worked with are public defenders,” Campbell said. “I’ve seen outstanding results — and, believe me, I’m the one fighting against them. Certainly, the motivation isn’t money — pay starts at around $40,000, and felony attorneys might earn $50,000 or more. For that, a misdemeanor defender may handle 150 cases at any given time, and a felony attorney between 40 and 80. “Which is a lot of serious cases to be juggling at the same time,” Daniels said. Turnover in the Public Defender’s office “can be 14 to 20 per- cent, depending on the year,” Thomas said. To help with retention, the new state budget increases the salaries of assistant public defenders and assistant state attorneys by $2,000 to $4,000 depending on years of service. Meanwhile, the system is increasingly strained with homicide cases. As of May, the Public Defender’s office was handling 14 murder cases circuit wide: 10 from Leon, four from outlying counties. “They’re coming in at an unprecedented rate,” Thomas said. The Public Defender’s office now has three lawyers working capital trials and one in capital appeals. What deeply motivates defenders is “truly understanding how important it is that if we allow the government to infringe on the least of our citizens’ rights, that they will eventually infringe on ours,” Thomas said. “That’s the way every monarchy, fascist, whatever you want to call it, centralized government works when it wants to take over everything. First we’ll get rid of the gypsies. We’ll get rid of the blacks. We’ll get rid of these people or those people. We’ll go after the poor people first. We’ll go after their rights. We’ll suspend Fourth Amendment rights so we can stop your car for any reason,” he said. Rochelle Koff contributed to this report.